A colleague and I were discussing how his nine year old son had completed his Cub Scouts Cyclist Activity badge. We noticed how some of the bike maintenance tasks that had been identified were, shall we say, less than ‘optimal’. Now you might say this is a bit unfair to judge a Cub Scout lesson through the eyes of a reliability professional (and you’d be right) but what was interesting is that we often see the same sorts of issues within the industry. The first thing we noticed is the tasks aren’t really tasks, but a list of components; i.e. they tell you what to look at but not what to look for. In other words, how a task is written is clearly very important. In the example above “check the back tire” does not help us know what to look for. Is it there? Is it worn? Does it have air in it? Is it damaged? With vague work instructions like these maintainers are left to decide what to inspect for, which will inevitably lead to inconsistent maintenance. While working with clients to develop their maintenance plans, the RCM process we use ensures that each maintenance task addresses a specific failure mode, or modes. We can run a report that shows this link, which in turn allows the maintainer to understand the purpose of the inspection. The task can also be written in such a way as to focus the maintenance on identifying the potential failure. Another issue with the tasks above is there isn’t any data or figures included in the task. How much tire wear is acceptable? What is the minimum tread depth? What pressure should the tire be at? Is there a minimum and maximum? There also needs to be instruction as to how frequently to do the bicycle checks. Every ride? Every month? Things like checking your wheels are fitted tightly might need to be performed prior to every ride, but checking a chain for wear could be performed every few months. Not having this information can lead to items being under or over maintained, leading to possibly unsafe equipment condition or wasted effort. We can see that for the failure mode ‘chain worn’ we’ve identified an inspection task to periodically check the chain for wear to address that failure mode. We’ve specified the method to use (a wear gauge, as opposed to a simple visual check or performing a measurement) and an acceptable limit (less than 75% worn). This is a clear communication of what is required, minimizing the chances of ineffective maintenance. 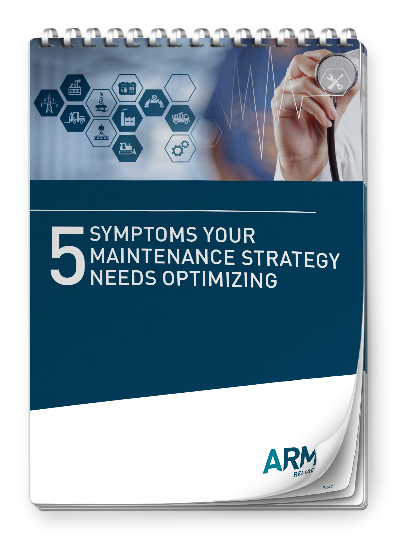 In the example above I touched on the point that there may be a choice of maintenance tasks that could be performed, as well as whether or not to perform any maintenance at all. The RCM process also helps us to choose an appropriate maintenance task and it is essentially a balance between the severity of the failure vs. the cost or effort to perform the maintenance. Often severity is thought of in terms of cost e.g. lost production, but it also covers the impact on safety or operational impact. The operating context of the equipment also affects the severity. The example below shows how we use the AWB software to select an optimal maintenance task interval. Imagine we only ride our bike for getting around the town we live in for non-essential tasks, such as popping to the shops to buy some milk and a newspaper. In this case a punctured tire is not critical and we might decide not to carry a spare tube and tools to change it (pump, tire levers etc.) and instead to perform ‘breakdown maintenance’ i.e. walk the bike home and repair it there. Now if we were instead on a vacation touring a remote location, far from any nearby towns, this ‘run to fail’ strategy would result in a very long walk and clearly not be suitable! So assuming we were carrying a spare tube, and relying on it in remote locations, what happens if there is a problem with the spare tube? “Did I remember to fix it after my last puncture?” What if there is a manufacturing defect?” Or “what if I didn’t find the thorn that caused the first puncture still stuck in the tire and got a second puncture?” These are called ‘hidden failures’ and require failure finding tasks in order to mitigate them. We might also set our bicycle maintenance strategy assuming we do all the checks at home in the garage, but do we also need to consider operating checks? For our bike this might include using our senses to listen for any abnormal noises, rattles, looseness, creaks or squeaks when riding the bike. We are also checking the operation of the gears and brakes through use, cleaning the bicycle down after use and oiling the chain afterwards to prevent corrosion. This is an example of ‘operator maintenance’. How do we manage failures during use? If we notice something is wrong during use that we can’t fix, we would note it and arrange some planned maintenance at the bike shop before the warning becomes an actual failure that renders the bike out of action. For operating failures that occur with little or no warning time we can address these in a number of ways; carrying spares (e.g. a spare inner tube), or tools to repair the failure out in the field (puncture repair kit). We can also introduce re-designs (sealant in the tire to seal holes as they occur). So there it is, writing an effective maintenance strategy can be as easy as riding a bike. ¹Availability Workbench™ is authored by Isograph Ltd. ARMS Reliability are authorized global distributors, re-sellers and implementers of the software application. 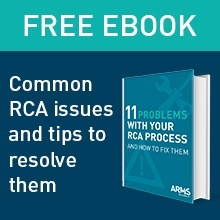 Can you have too much detail in an RCM study? So how do we know when we’ve ‘drilled down’ far enough to be thorough but not too far? So what is a suitable failure management policy? The failure management policy is the approach chosen in order to mitigate the consequences of failure to an acceptable level. Let’s consider two pumps; one is a large, complex gas compression pump and the other is a small air conditioning pump on a fork lift. What is the function of the machine? What is its purpose? Understanding this will help to understand the consequences of the failure, which in turn will help define the criticality. How critical is it if the failure occurs? Criticality is a product of the severity of the consequences of a failure multiplied and the frequency of occurrence. In the case of large gas compression pump, a failure could result in product not being delivered, costing $1000’s per hour of downtime. Or for the forklift a/c pump it could be returning the forklift to be swapped for another in the fleet. Another aspect to consider is what is the corrective action? Is it feasible/cost effective to stock the spares and perform a repair activity in-situ, or to simply replace with a new unit? For a large, expensive pump it would be more expensive to replace the entire unit than to replace a worn seal. Whereas for a small a/c pump it would be more cost effective to discard it and replace with a new one. Are the failures evident in normal operation, or do they require fault finding to be performed? Can the seals be seen to check for signs of leakage? How accessible is the equipment? Is scaffolding required? Is the plant required to be shut down? Does the equipment need to be partially dismantled e.g. removing guards etc? Is there any redundancy in place? Is the equipment in a remote location, or a challenging environment? These are just some things to consider when considering what a ‘suitable failure management policy’ might be for your particular piece of equipment. For the large gas compression pump, it is expensive to replace, critical if it fails and is accessible for in-situ repair during scheduled shut downs. In this case the FMEA would be far more detailed, including several failure modes, each with its own inspection or planned maintenance tasks, which would combine to form the ‘Failure Management Policy’ for this pump. For the small AC pump on a forklift, let’s say it’s inaccessible for inspection, not critical if it fails and would be replaced rather than repaired. Our FMEA might only include a small number of failure modes, such as ‘Seal worn’, ‘Impellor worn’ and ‘Motor burnt out’ and our corresponding ‘Failure Management Policy’ would be ‘No scheduled maintenance’ and the corrective action would be to ‘Replace AC pump’. In conclusion, it can be a challenge to know how much detail to go into when performing a FMEA analysis, but the aim is to go into enough detail to determine a suitable failure management policy. Considering the ‘bigger picture’ of the equipment you are analysing will help guide you as to the level of detail required. Desarrollo del Programa RCA: Plan de Gestión del Cambio Humano (por sus siglas en Ingles HCM) : ¿Realmente lo necesita?